Splash pages, you gotta love 'em. A blank canvas where the artist can hit you with a large dose of illustrated 'wow'. This week, I wanted to do a post about how three Hollywood guilds are supporting the Jack Kirby's rights case with Marvel. But the more I thought of how great it is the Kirby's are getting support, the three reminded me of Wolverine's claws been exposed. The ultimate sign of support any fight in the Marvel u ever needs. And here we are, with a splash not by Kirby, but with David Finch, of a character Kirby didn't create, but one still ready for a fight anyways. If only he was in the classic Byrne era brown and gold. I miss those boot ears. 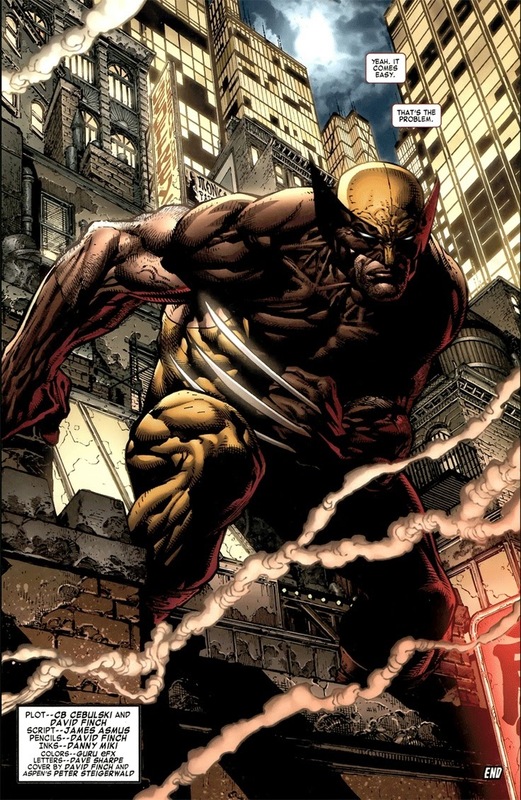 For me, Wolverines brown costume always seemed far better, far tougher than his wussy yellow costume. I always found it odd that he wore yellow as part of his fighting colours as it just wasn't very 'savage'. When he wore it I the 80s it kinda rocked for me having his brown duds on him. And needless to say I hope dearly that the Kirby heirs get their just due in court - its well about time Marvel faced up to their responsibilities. Thanks Karl, you and me both on both counts. Marvel needs to give the Kirby's all they give Stan Lee, if not more and it never makes sense to me that a former covert agent ever went into battle in hi-vis cycling neon... or the closest colour to it.